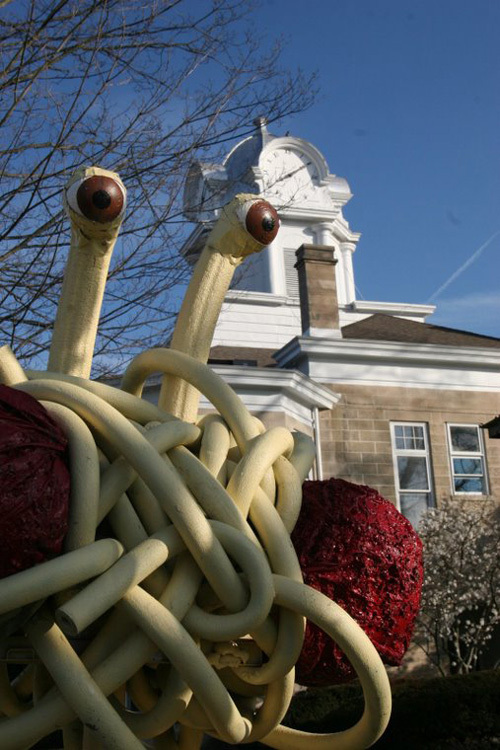 Members of the Crossville, TN Chapter of The Church of the Flying Spaghetti Monster have installed a giant Flying Spaghetti Monster statue outside The Cumberland County Courthouse in Crossville, Tennessee. We are lucky enough to live in a country that allows us, its citizens, the freedom of speech. I have chosen to put up a statue of the Flying Spaghetti Monster to represent the discourse between people of all different beliefs. The many faiths, ethnicities, and backgrounds of Cumberland County’s residents make our community a stronger richer place. I respect and am proud that on the people’s lawn, the county courthouse, all of these diverse beliefs can come together in a positive dialogue. Here, we are all able to share the issues close to our hearts whether it is through a memorial to the soldiers killed fighting for our country, the Statue of Liberty honoring our nations welcoming promise to all, a group’s fight to stop homelessness or powerful symbols of faith. I greatly treasure this open forum between everyone in the community. The Flying Spaghetti Monster is a pile of noodles and meatballs, but it is meant to open up discussion and provoke thought. 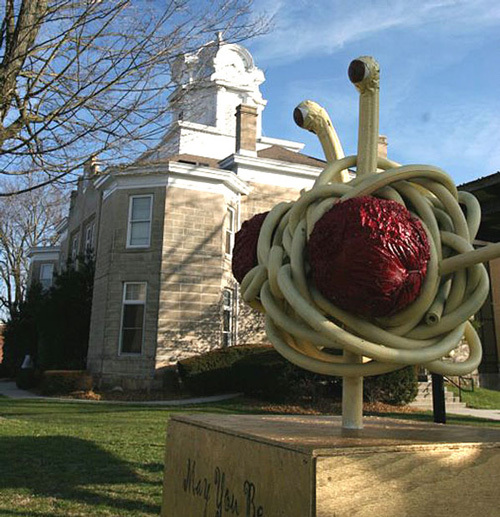 Being able to put up a statue is a celebration of our freedom as Americans; a freedom to be different, to express those differences, and to do it amongst neighbors even if it is in a noodley way. Here’s local news coverage of the installation. UPDATE: Daniel Terdiman did a follow-up story on CNET News.com where he spoke with Ariel Safdie, a member of the Crossville, TN Chapter of The Church of the Flying Spaghetti Monster, who was involved with the installation.